We are pleased to welcome you to the community and to tell you about ourselves and what we offer. As your partner, AFRINIC promises to provide you Internet Number Resources and the support necessary to successfully manage the resources. In addition, we promise to provide the support you need to deploy IPv6. The AFRINIC Team is always at your service and delighted to offer you any support, advice and answer any questions you may have. AFRINIC provides services to its members namely organisations (mostly Internet Services Providers and End-users) within its geographical region which covers the African continent and Indian Ocean. The AFRINIC service region is divided into six sub-regions namely Northern Africa, Western Africa, Central Africa, Southern Africa, Eastern Africa, and Indian Ocean. Below is a summary of all the internet number resources from which AfriNIC allocates/assigns to its members. Numbers held by every RIR are issued by IANA (The Internet Assigned Numbers' Authority). Some numbers below had been allocated to some RIRs by IANA before AfriNIC recognition. These RIRs reserved the same numbers for allocation within Africa, hence, AfriNIC taking such resources over. Any inquiries should be addressed to hostmaster[at]afrinic.net. (*) Local Internet Registry (LIR): A Local Internet Registry (LIR) is an Internet Registry (IR) that receives allocations from AFRINIC and primarily sub-allocates or assigns address space to their customers. LIRs are generally ISPs. 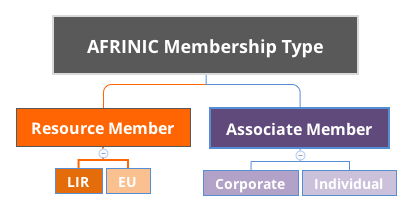 (**) End User (EU): Any entity, corporate or individual that receive services (Number Resources assignments) directly from AFRINIC for exclusive use on its own service infrastructure. Associate Member: Any individual person, corporate body of the public sector including governmental, and intergovernmental organisations, non-governmental organisations as well as those of private sector entities who do not use Assigned Number resource under the Registration Service Agreement (RSA) but who have manifested a substantial interest in the number resources management as well as in the mission of AFRINIC to become its member. Registered Member: Any Director upon assumption of office and who is a member within the meaning of the Companies Act 2001 of Mauritius, as amended from time to time.